WARNING! - I will not be held responsible if your Paypal account lists an incorrect address on your Paypal account. Please check your Paypal address before you place an order with me. Use your credit card or bank account (where available)  Simply choose this option when you check out using Paypal. That's right, Paypal will let you pay with your credit card and even your bank account in some areas. Click on Image to Enlarge - These high quality 1mm thick Pickguards are non-ferous (non magnetic) beautiful brushed-steel. Because they are non magnetic they will not interfere with the pickups or electronics of your guitar. Plus they are just Drop Dead Gorgeous and will add a touch of Class to your guitar! Before ordering please download the PDF below and play it out from your printer at 100% to check and make sure the pickguard will fit your guitar. NOTE - I have never understood why the Tele's Pickguard and Control Plate were separate. So I started experimenting and came up with this design. This will give your Tele a very unique and Classy look. WARNINGI have seen aluminum pickguards on sale for cheap on eBay. 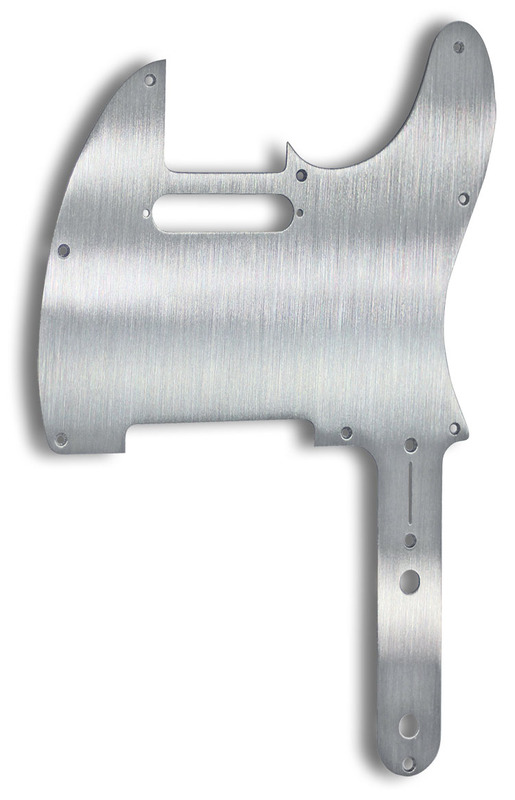 Aluminum will make your entire pickguard microphonic sending your pickups into feedback hell. DO NOT USE ALUMINUM! Non-Ferous Steel that I use is the only metal material (other than brass) that will not interfere with your guitar's pickups. 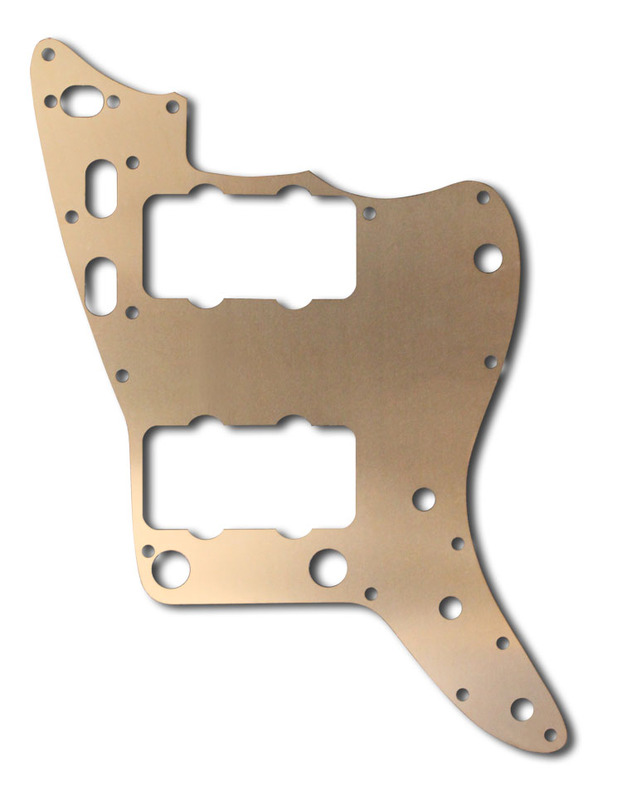 Click on Images to Enlarge - These high quality 1mm thick Pickguards are non-ferous (non magnetic) beautiful brushed-metal. Because they are non magnetic they will not interfere with the pickups or electronics of your guitar. 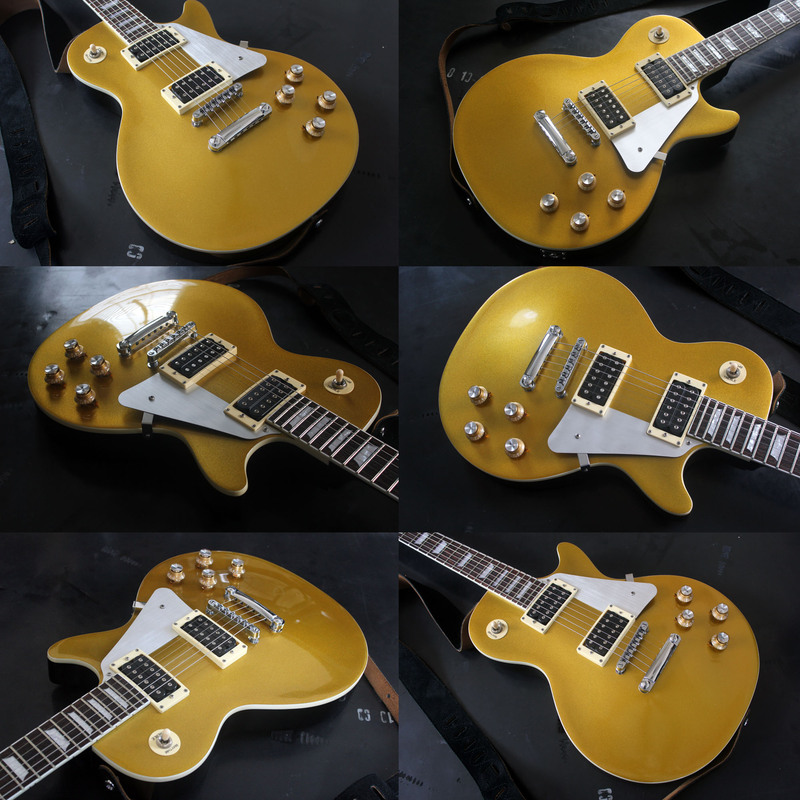 Plus they are just Drop Dead Gorgeous and will add a touch of Class to your guitar! Before ordering please download the PDF below and play it out from your printer at 100% to check and make sure the pickguard will fit your guitar. Before ordering please download the PDF below and play it out from your printer at 100% to check and make sure the pickguard will fit your guitar. As far as I know there are no Pickguard Shields made anywhere for the Fender Jazz Bass which is rather surprising considering the popularity of this Bass. With this design I have incorporated both the older Vintage Pickguard Designs and the Newer Designs. NOTE. This will not work with the new Fender Elite Jazz Bass (Fender shortened the horn on the cutaway and added an extra fret on the neck). So there was just no way to tweak the design to fit. I may offer one for the Elite Series at a later date. You’ll see I have included the thumb and finger rest screw openings for both that are installed above and below the strings. I have also included a variety of screw placement designs and a cutout to accommodate the neck heel truss rod adjustment opening. I have also added a tab that protrudes out where the Control Panel meets the Pickguard. This will connect the Pickguard Shield to the Control Panel’s Grounding Plain. Click on Image to Enlarge - We now offer the thickest Copper Pickguard Shields on the Net! 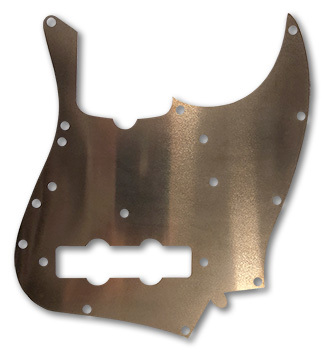 These .006" Thick Copper Pickguard Shields will fit both righty and lefty guitars. These are High-Quality Laser Cut Shields (not hand cut like our competitors now offer). These Copper Shields are designed to fit both Fender Vintage and Modern Pickguards perfectly without alteration, unlike our competitors designs! 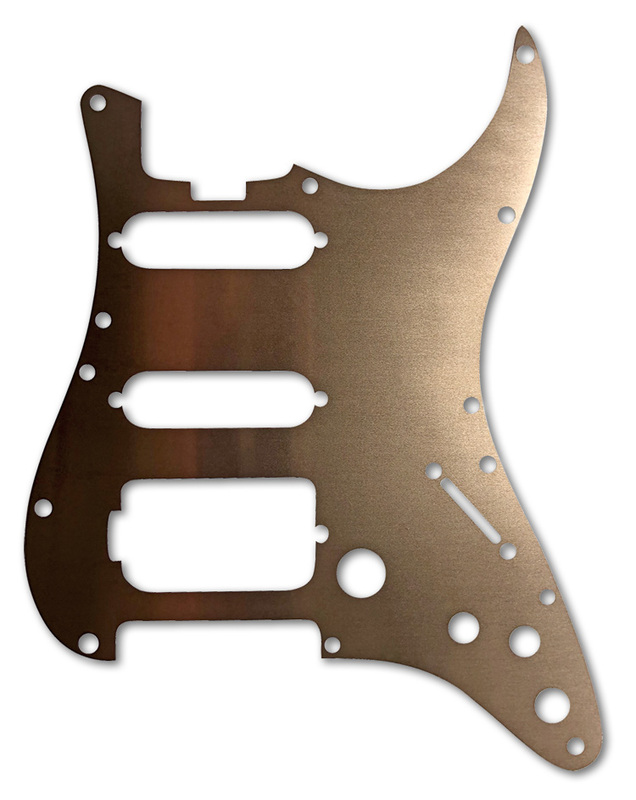 I have taken and tweaked the design so it will also fit, without adjustment, 95% of the third party Pickguards in the market. No wiring necessary, just attach and start enjoying the noise-canceling benefits of a fully shielded Pickguard. Also eliminates static buildup some pickguards exhibit. I Guarantee these to fit Genuine Fender American Pickguards but some adjustment may be necessary for third party manufacturers. 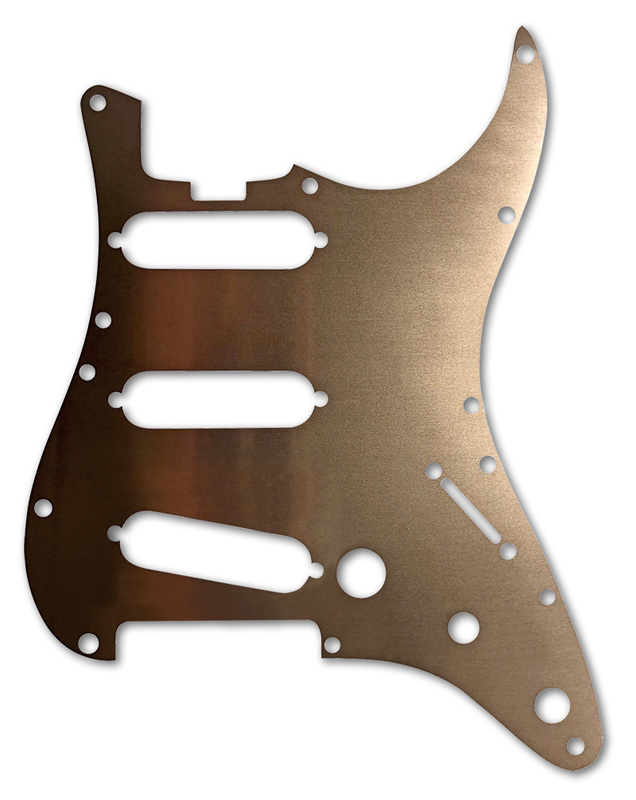 Click on Image to Enlarge - We now offer the thickest Copper Pickguard Shields on the Net! These .006" Thick Copper Pickguard Shields will fit both righty and lefty guitars. These are High-Quality Laser Cut Shields (not hand cut like our competitors now offer). These Copper Shields are designed to fit both Fender 8-hole Vintage and 11-hole Modern Pickguards perfectly without alteration, unlike our competitors designs! Click on Image to Enlarge - I have recently updated the design to accommodate the new Fender Elite Series. "Neck Heel Truss Rod Adjustment" access has been added. 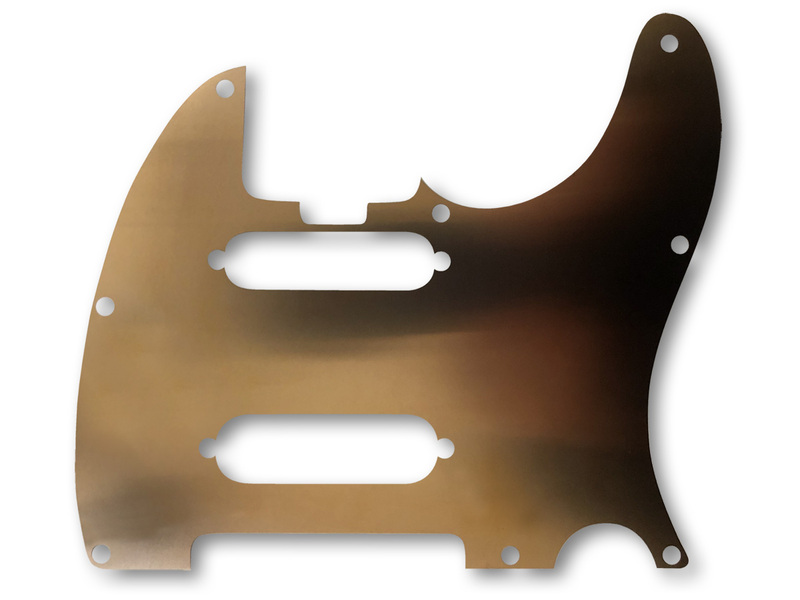 We now offer the thickest Copper Pickguard Shields on the Net! These .006" Thick Copper Pickguard Shields will fit both righty and lefty guitars. These are High-Quality Laser Cut Shields (not hand cut like our competitors now offer). These Copper Shields are designed to fit both Fender 8-hole Vintage and 11-hole Modern Pickguards perfectly without alteration, unlike our competitors designs! Click on Image to Enlarge - I have recently updated the design to accommodate the new Fender Elite HSS Shawbucker Series. "Passing Lane" Switch and "Neck Heel Truss Rod Adjustment" access have been added. But I have taken and tweaked the design so it will also fit, without adjustment, 95% of the third party Pickguards in the market. No wiring necessary, just attach and start enjoying the noise-canceling benefits of a fully shielded Pickguard. Also eliminates static buildup some pickguards exhibit. I Guarantee these to fit Genuine Fender American Pickguards but some adjustment may be necessary for third party manufacturers. Click on Image to Enlarge - I have recently updated the design to accommodate the new Fender Elite Tele Series. The Neck Heel Truss Rod Adjustment access hasbeen added. 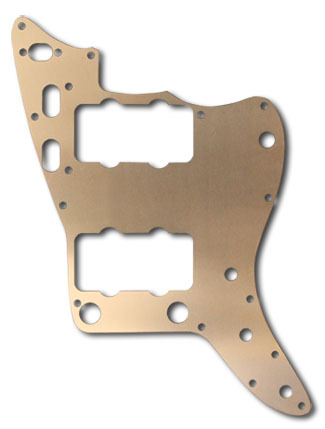 We now offer the thickest Copper Pickguard Shields on the Net! These .006" Thick Copper Pickguard Shields will fit both righty and lefty guitars. These are High-Quality Laser Cut Shields (not hand cut like our competitors now offer). These Copper Shields are designed to fit both Fender 5-hole Vintage and 8-hole Modern Pickguards perfectly without alteration, unlike our competitors designs! But I have taken and tweaked the design so it will also fit, without adjustment, 95% of the third party Pickguards in the market. Start enjoying the noise-canceling benefits of a fully shielded Pickguard. Also eliminates static buildup some pickguards exhibit. I Guarantee these to fit Genuine Fender Pickguards but some adjustment may be necessary for third party manufacturers. Before Before ordering please download the PDF below and play it out from your printer at 100% to check and make sure the pickguard will fit your guitar. 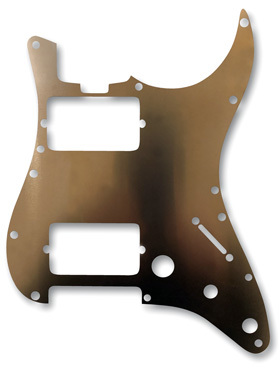 Click on Image to Enlarge - We now offer the thickest Copper Pickguard Shields on the Net! 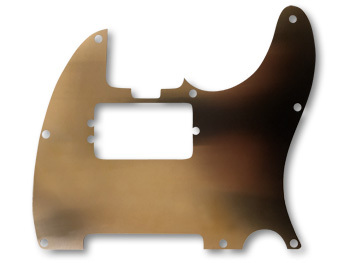 These .006" Thick Copper Pickguard Shields will fit both righty and lefty guitars. These are High-Quality Laser Cut Shields (not hand cut like our competitors now offer). Our shields have been patterned after a 1962 Fender Jazzmaster pickguard, and is therefore a direct fit for USA / AVRI model Jazzmasters, but can easily be trimmed to fit ANY Jazzmaster (MIM, MIJ, Squier). Start enjoying the noise-canceling benefits of a fully shielded Pickguard. Also eliminates static buildup some pickguards exhibit. I Guarantee these to fit Genuine Fender American Pickguards but some adjustment may be necessary for third party manufacturers. Warmoth  If you have a Warmoth Jazzmaster this shield will require quite a bit of trimming to work. Although difficult, if you have the patience it can be done. Our copper can be trimmed with scissors. This is not guitar cabling, it is for use in the electronics of a guitar. Absolutely the best inner guitar electronics interconnect sold anywhere! This Stuff Rocks! Silver-Plated Copper! And Silver-Plated Copper Braid Shield! Not only does it offer Great Shielding Properties, it's also the best sounding wire I've ever heard! Nominal Outside Dia. is .087. 90% Silver. That's right, I said 90% Silver! Teflon-Coated. Teflon is heat-resistant so it will not melt. Sold in 36" (3') or 91.5 cm lengths. White. 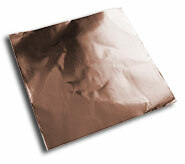 Many of you have requested that I start selling adhesive-backed Copper Foil (adhesive is conductive). This Copper Foil is thinner than our non-adhesive 12" x 12" copper sheets we sell (we also sell the regular 40 gauge 12" x 12" Copper Sheets below. Because this copper foil is thinner it is much easier to use for lining the cavities inside the body of your guitar. This can also be used to line the back of the pickguard. 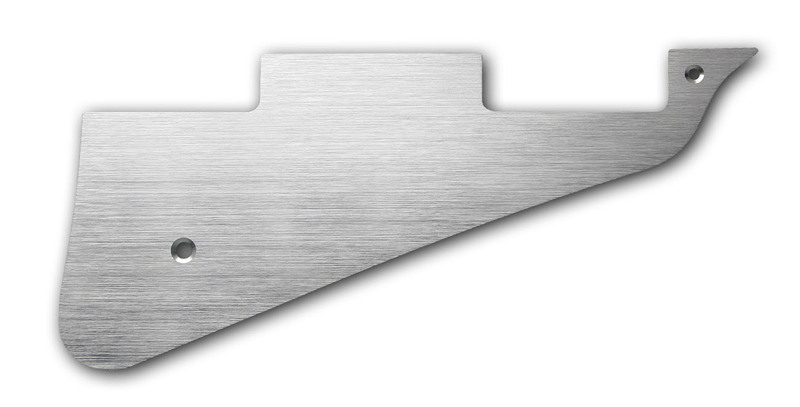 Use this to line the cavities of your guitar or on the back of your pickguard for maximum noise rejection. This is NOT Copper Foil! This Copper is THICK 40 gauge Copper. Don't settle for thin and hard to work with aluminum foil. CLICK HERE FOR AN UNSOLICITED USER REVIEW OF OUR SHIELDING PRODUCTS - CONTAINS BEFORE AND AFTER MP3S - THIS IS PROOF POSITIVE THAT OUR PRODUCTS WORK!